Get upcoming dates, vendor and table forms along with safety compliance guidelines for both attendees and sellers. 1435 Beall at 15th St.
No live, loaded ammo should be brought to the gun shows by any patron but is available for sale by the venders. – All guns are tied and rendered inoperable. This means all cartridge and pellet guns. – Guns utilizing clips must have the clips removed even if they are in a display case. – Powder and primers must be in original factory packaging and vendors must adhere to quantity limits not exceeding those set by our insurance company. – Prohibited items are removed immediately when discovered because they pose an immediate danger to the public. 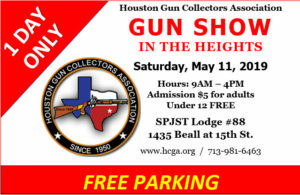 – Items not allowed by Houston City Ordinance or by the Reliant Hall Contract with H.G.C.A. are not sold or distributed. WHAT IS ACCEPTED AT THE GUN SHOW? Firearms – modern rifles, pistols, shotguns meeting NFA standards, antique rifles, pistols, shotguns, gun cases & bags, gun sights, scopes, stocks, and finishing materials, cleaning kits and materials, parts, cannons earlier than 1898, cannon parts, relics, concealed carry items, individual police officer equipment, clips, loading devices, slings, non-guns, air guns, non-cannons. • Knives – knives, swords, bayonets, sharpening devices, knife making materials, straight, & antique razors. • Loaded Ammunition – “No live, loaded ammo should be brought to the show by any patron but is available for sale by the vendors.” • Military – uniforms meeting original specifications, equipment, manuals. • Indian Artifacts. • Western – reenacting clothing 18th and 19th century, pistol belts and holsters, hats and caps. • Reloading components – Brass cases, bullets, pellets in sealed containers, BB’s in sealed containers, reloading equipment, gauges, primers in sealed containers, and nitro powder in sealed containers (no black powder, coated black powder allowed). • Archery – modern archery equipment (no arrows). • Art – historical, western, hunting, trench art, scrimshaw, scaled and antique toy soldiers (not dolls). • Tools – antique. • Hunting – game calls, decoys, traps, skinning equipment, game bags, scent and scent cover items, tarps, hunting tree stands, feeders, guided hunting trips. • Collectables – books, manuscripts, maps, manuals, magazines, collectable currency, antique business and government records, photographs, coins and stamps. Sale of food or drink.